For simplicity I offer two standard picture sizes, and include an elegant white or ivory coloured double mount to fit 'off the shelf' frames. Or, of course, you can take the picture to your usual framer. A portrait of an animal is £140 in graphite, £160 in pastel and £180 in coloured pencil. A portrait of a person is £180 in graphite, £200 in pastel and £220 in coloured pencil. 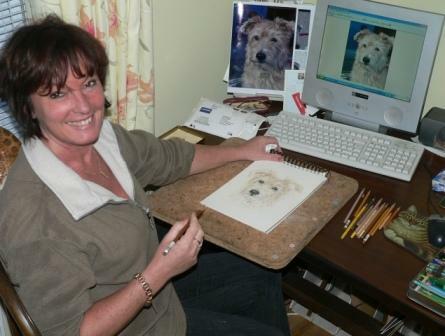 A portrait of an animal is £200 in graphite, £220 in pastel and £240 in coloured pencil. A portrait of a person is £240 in graphite, £260 in pastel and £280 in coloured pencil. UK Special Delivery (Royal Mail) is included in the price. Overseas delivery charges will be discusssed at the outset. I'll be drawing a head, or head-and-shoulders, portrait . In animal portraits this will include a basic headcollar or dog/cat collar, if you wish. Bridles, harnesses, fancy collars, detailed backgrounds and other objects in the picture will cost more so I'll discuss this with you at the outset. I can't stress enough how important it is to provide good quality reference photos. If I don't have the opportunity to meet the subject I'm totally dependent on being able to see clear features and colouring to ensure I capture the personality and likeness. I'll have to turn down the work if I'm not happy with your photos; I don't want to disappoint you. My work schedule is generally fully committed for about three months ahead but there is sometimes leeway where I can tweak timings a little. Once we've agreed the project and completion/delivery date I'll need a non-refundable deposit of £65 for a single subject or £95 double subject by bank transfer to confirm your place in my schedule. I will keep you advised of progress with progress photos for approval. Once you are completely satisfied, send me the balance of your payment and I'll despatch your picture. Payment for multiple orders is due as each picture is completed.